Update: Thursday, Aug. 2, 5:32 p.m. EDT: This story has been updated with an attribution to Fox 9. The white woman tried to walk through the protesters because ... well, that’s kinda what white people do. Genetic biologists have theorized that melanin deficiency also comes with a lack of the “step aside” gene common in most other human beings. But the Amber-American likely had no idea that this particular crowd was composed of people who had an abundance of the “not today” gene. The white woman’s thin lips proved to be an inadequate cushion for absorbing the barrage unleashed on her. 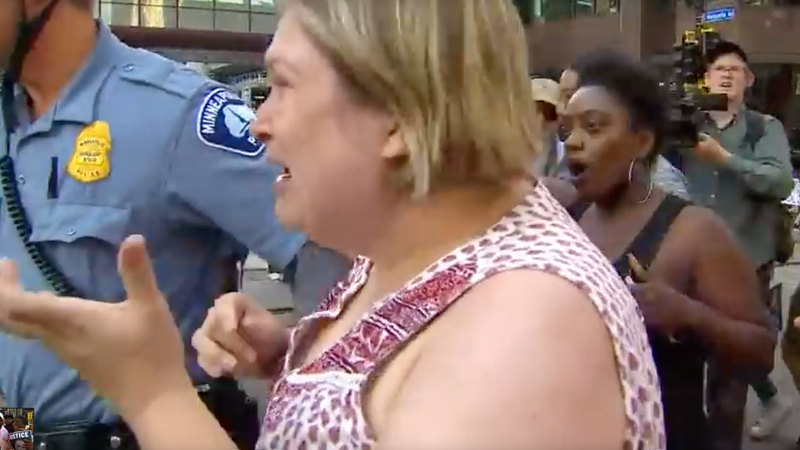 She immediately turned and ran to the nearest police officer wailing, “I just want to go home,” according to Fox9, seemingly unaware that she was precariously close to being rocked to sleep by one more chin punch. “I didn’t do anything!” said the female Kevin James, as the cop consoled her. I can tell from the way she’s holding that woman back, she’s either an undercover member of Doral Milaje or the one usher at every black church who shields the audience from the wild Holy Ghost shouter. As of this date, the white woman has not been identified, although some suspect that she may be home writing thank you notes to the woman who so kindly took the time to donate free dental work at a police protest. If there is indeed a tooth fairy, Rebecca’s bicuspids can be found in front of the downtown Minneapolis Starbucks. She will be expecting her money. The black woman who so generously offered up her hands to be caught by Crying Karen has also not been identified but she is rumored to have signed a 2-fight deal with Mayweather Promotions.